Confession of the day: I may have been the only 90's kid who didn't grow up religiously watching Disney movies. In fact, I hardly watched any of them when I was a child for reasons I wouldn't know. Only when I was a teenager did I see some of them together with friends who had watched them when they were young. 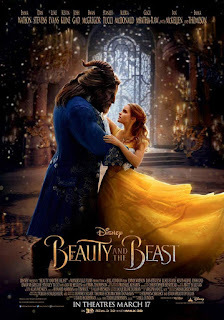 It was one of those friends who also convinced me to go see "Beauty and the Beast" with Emma Watson and Dan Stevens at the cinema earlier this year. The movie is the classic adaptation of the fairy tale about a monstrous-looking prince and a young woman who [spoiler alert!] fall in love. So what could go wrong? More than you would expect, somehow this movie manages to kill every subtle beautiful little thing that had made the original special. The worst part about it is though that everything looks fake. "Beauty and the Beast" may include some of the worst CGI I have ever seen. There is hardly a hint of authenticity and worst of all is the Beast. His whole facial expression and eyes were just lifeles - and while I usually love Emma Watson and thought she would be a great fit, she ended up being a very unconvincing Belle. Overall I felt the film was rushed as there was lack of compassion and chemistry between the characters. There was a lot of CGI and green screen which simply could have been replaced by normal acting, it would have done the movie good.